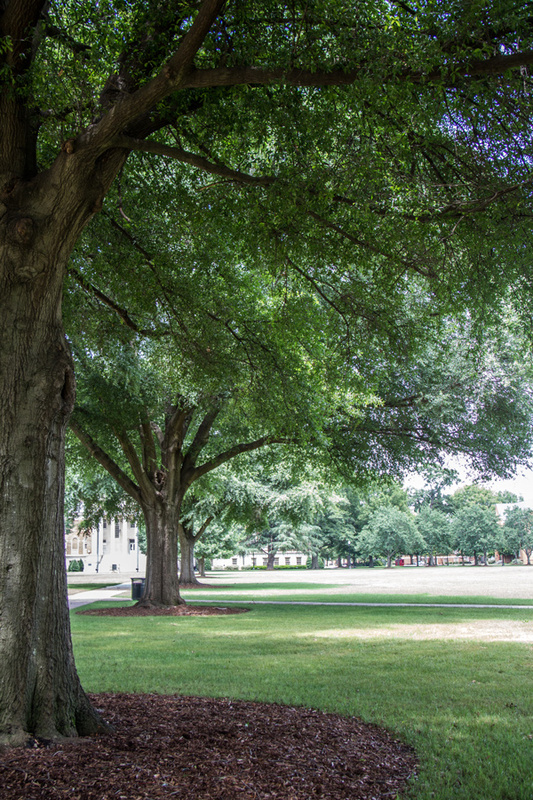 The Quad, the central green space on the UA campus. For a research profile of our department, read our Research Overview. Additional general information about the department can be found in this department fact sheet (PDF). If you are a current UA physics major interested in a Masters in Physics, you may be interested in UA’s Accelerated Masters Program. The minimum requirements for admission include a combined verbal plus quantitative score of at least 300 on the general GRE (1000 on the prior scoring system); this GRE score must be less than five years old at the time of enrollment. For applicants whose first language is not English, we require a TOEFL score of at least 550 on the paper-based test (PBT) or 213 on the computer-based test (CBT) or 79 on the internet-based test (iBT) or an iELTS score of at least 6.5; these scores need to be less than two years old at the time of enrollment. If you have received a degree from a U.S. institution within three years of the time of enrollment, a TOEFL score is not necessary. You can start the application process at the University of Alabama Graduate School’s website, http://graduate.ua.edu/application, and follow the instructions on that site regarding the documents you upload (statement of purpose, resume/CV, unofficial scans of transcripts and scores) and the documents that must be sent through official channels to the Graduate School (official transcripts and scores). IMPORTANT: It is very helpful if you upload unofficial copies (scans are fine) of your transcripts, GRE, and TOEFL scores online under Other Documents of your online application form. This allows the admissions committee to examine these documents before the official versions sent from your university’s registrar office or testing services are received and recorded by the Graduate School. We will evaluate your statement of purpose very carefully. Your statement of purpose should clearly describe how an advanced degree in physics or astronomy relates to your career goals. Please state if you have a clear preference for a particular area of research and whether your inclinations are more theoretical, experimental, or observational. If you are considering a range of possible research areas, please describe them. Our Research Overview summarizes departmental research projects and collaborations; individual faculty members’ research interests are described on their webpages, which you can find via our department directory. What factors are important in securing a graduate position at UA? How are graduate students supported financially? Do I need to have a bachelor’s degree in physics or astronomy to be eligible for admission? Can I apply to your program even if I have not completed all the requirements of my previous degree? What are my prospects after obtaining a Masters or PhD? What are the different options under “Status” in the online application? I am an international student. My bachelor’s program is only three years. Am I eligible for admission? I am an international student. Do I need to submit an I-20 form when I apply? I am an international student. Will I be able to get help navigating the visa process? I am an international student. Am I eligible for funding? In order to be considered for university fellowships all application materials should be received by December 15. To receive full consideration for departmental support via graduate teaching or research assistantships, all application materials should be received by January 15. We will continue to accept applications after January 15, although there is no guarantee that we will have positions available after this date. We strongly encourage applicants to apply as early as possible. Decisions are normally made in multiple rounds. University fellowship candidates are selected and offers made by mid-February. Department assistantships and fellowships are decided and offer emails sent by mid-March. Students have until April 15th to accept offers. However, we strongly encourage students to accept/reject offers once they have made a decision. Late offers to waitlist candidates are possible after April 15th. If you have not received a decision by April 15th then you may be on a wait list. Students not accepted for Fall admission (but not rejected) can ask to be considered for admission the following Spring. – The committee looks for proficiency (As or Bs) in undergraduate physics, especially upper level physics courses (electricity and magnetism, quantum mechanics, thermal physics, and classical mechanics). – The committee looks for GRE scores higher than 300. A strong performance in the quantitative section is beneficial but not necessary. – We do not require the PGRE. However, you may submit a PGRE score if you feel it can support your application . Please note, a PGRE score above 70th percentile allows us to waive the qualifying exam requirement of 1st and 2nd year graduate students. – Previous research experience, especially those which lead to presentations at regional or national conferences or publication of papers, are looked upon very favorably and can balance lower grades. – Reference letters by research advisors and upper level physics instructors are very important. – Your statement of purpose is very important. It should clearly describe how an advanced degree in physics or astronomy relates to your research and career goals. You should show familiarity with research areas and faculty. The SoP should also address any weaknesses in your application package. Average undergraduate GPA: 3.6 (3 – 4) — on 4 point scale. Average Physics GRE score: 830 (660 – 990) — not required for admission*. Average P-GRE percentile: 73% (42% – 94%) — not required for admission*. *Half of the incoming 2017 students took the Physics GRE. This fraction has varied significantly over the last 5 years. Please note, students with low scores in one or more area normally have high scores in another and/or strong letters of reference and/or research experience. Please review the minimum criteria for admission. Continuous financial support is available for PhD students in good academic standing either through teaching assistantships or fellowships. Tuition and fees are waived. Graduate students who are supported by a teaching assistantship or a fellowship also receive free health insurance. Salary/stipends range from ~$18,747 (9 month) to ~$26,000 (including summer support). Graduate PhD students are guaranteed summer TA support for their first year. In subsequent years, students generally receive summer support either through TAs or through their research advisor. The average 12-month salary for current graduate students is ~$24,000. Financial support is not available for Masters students. While we do not automatically require a bachelor’s in physics to be eligible for admission, we are looking for evidence that our applicants are prepared for graduate level physics. This is usually indicated to us by good grades in upper level undergraduate physics classes — two semesters of electricity and magnetism, two semesters of quantum mechanics, thermal physics, and classical mechanics. If you have not taken these classes as part of your degree, but have studied upper level physics on your own, we would require a Physics GRE score (most likely at the 50th percentile or higher) to consider your application in order for us to be assured that you are ready for graduate level physics. If you have not taken the above undergraduate physics courses nor the Physics GRE then it is unlikely that we would consider your application for admission. Yes, you can, but you will need to submit all materials demonstrating completion of your previous degree before you enroll here in January/August. Prospects after Masters or PhD? Students who graduate with an MS or PhD in Physics/Astronomy from UA have moved into multiple career paths, including academia, national labs, industry, teaching, as well as non STEM fields. Please see our Alumni page for information on career paths taken by our recent graduates. The University of Alabama Career Center provides career resources for all UA students and postdocs. The resource is especially useful for those wanting to move into industry. Incomplete — Some parts of your application are missing or have not been received yet. Grad Review — The grad school verifies that the min GPA/GRE thresholds have been met. Evaluations, Dept Review — Departments review applications. Decision — Accepted or Rejected. Most applications stay under “Grad Review” until Mid March. The department reviews applications once they are complete, even if the status is not updated. Students from certain countries, such as Nepal and some universities in India have a 3-year bachelor’s program plus a 2-year master’s program in physics. We require students at these universities to complete the 2-year master’s program to be eligible for admission in our program. No, this step is not necessary until after you receive an offer from us and intend to enroll. There is a significant international presence in the community, and help is available in obtaining visas. Continuous financial support is available for all PhD students in good academic standing either through teaching assistantships or fellowships. If you have additional questions about the department or the application process please contact us at physgrad@ua.edu.